Admissions at The Columbus School has the purpose of attracting families and students interested in an educational environment that directly involves each student in experiences to achieve their individual potential. The School believes in the importance of an educational philosophy for candidate families that is in harmony with the programs, services and resources offered by the School and is aligned to our TCS purpose. At The Columbus School children begin their first school year when they have turned 4 years old by July 31. The admissions process for this grade begins 3 years in advance to the year in which the aspiring student will start. To access this process it is a mandatory requirement to attend an Information Meeting for Prospective Parents. Please contact the Admissions Office for available dates and additional information. The Admissions Office will be open to public to receive applications and recommendation letters Tuesdays, Wednesdays and Thursdays from 7:30 p.m. to 3:30 p.m. The school reserves the right of admission and does not acquire any type of obligation just for receiving an admissions request. We will not accept extemporaneous applications or families who have not attended the Information Meetings for Prospect Families. The school year for which you are applying depends on the date of birth of your child. For example if your child is programmed to be born in August, but is born in July, his/her admissions process will begin a year before. 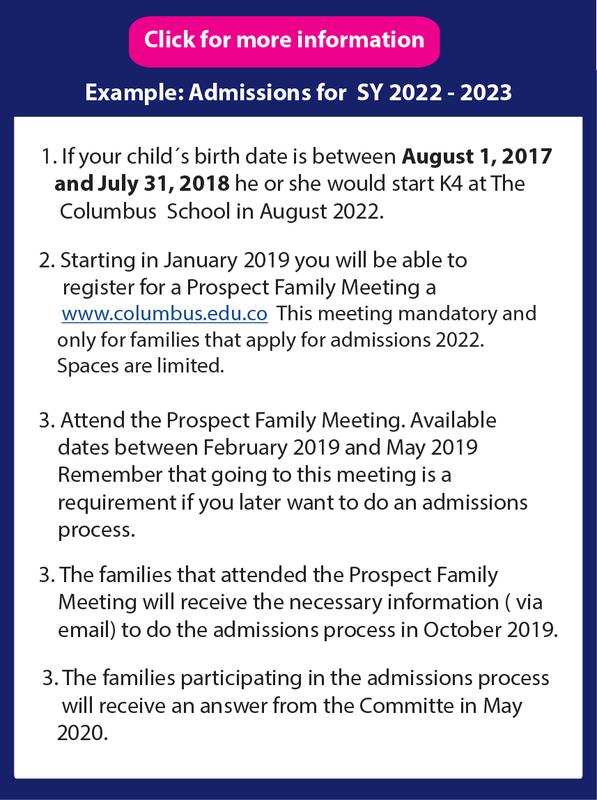 At The Columbus School we have extemporaneous admissions processes for families coming from other countries or cities at times different from the usual registration period. The extemporaneous process depends on the availability of space in the school year of application. 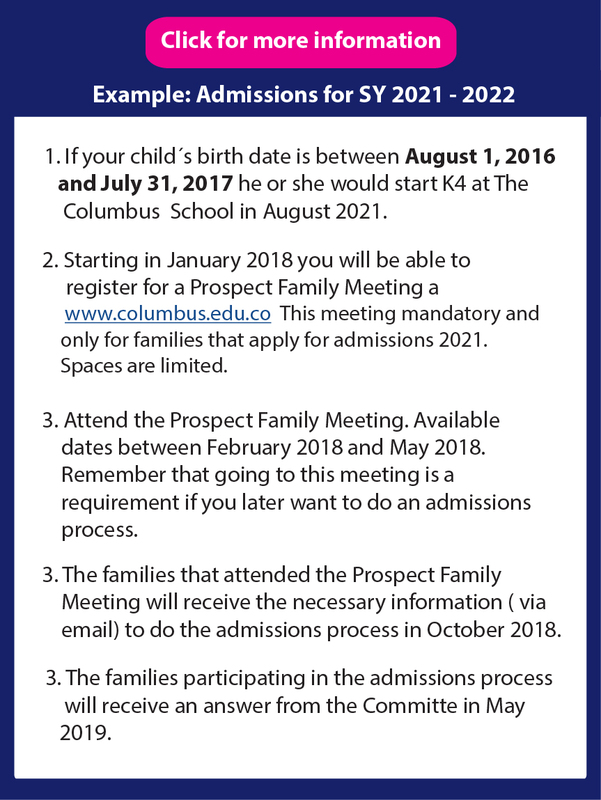 The Columbus School welcomes aspirants born between August 1, 2017 and July 31, 2018. Please choose one of the dates below to register for a campus visit.